The foundation of productive organic gardening is building and maintaining a healthy soil in which the plants will grow. It is the soil that provides the nutrients needed by plants and, consequently, much of the effort of the organic gardener is directed toward ensuring the condition of the soil is managed sustainably to enable plants to access those nutrients efficiently from one season to another. The soil in any home garden – from heavy clay to sand – can be nurtured into health and productivity through a combination of intelligent effort, good soil management practices and organic soil amendments. The goal is to build soil that has good structure and an optimum balance of mineral particles, organic matter, air, water and living organisms that provide nutrients needed for plant growth and health. The paper The Basics of Soil provides further information that will help you understand the composition and structure of soil. only using soil amendments that are necessary (eg to improve soil structure or correct pH) and are permitted by the Australian Certified Organic standard. Get to know your soil. Feel its texture and structure in your hands. Check its soil life and its pH. 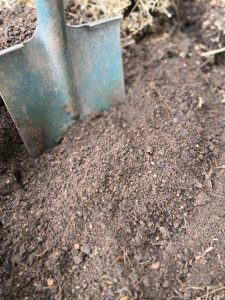 Organic gardeners will build on the soil they have in starting a new garden plot; for example, by adding compost and other soil improvers or using gypsum to break down clay. It is not sustainable practice to import soil, especially when its origins and composition is unknown. Commercial soil mixes may be needed in first establishing an organic garden when there is no alternative. Heavy clay soils form large solid clods that have poor aeration and which plant roots are unable to penetrate. The structure of this type of soil may be improved by the addition of gypsum which is a naturally occurring mineral soil conditioner that works chemically to help clay particles form crumbs. There is a simple dispersion test that can be used to check whether this mineral will be effective. In organic gardening, soil improvement is an ongoing process. Growing food plants takes nutrients from the soil which need to be replaced through the addition of compost and other bulk organic matter and green manure as part of a continuous cycle. Under these conditions, the soil will naturally incline to the neutral range (pH 6.5 to pH 7.5) and have a good balance of healthy soil organisms – including fungi and bacteria – that are vital to healthy plants. If you suspect your plants may be suffering from deficiencies in particular minerals (eg trace elements) check on a reliable reference source to help identify this. First check your pH. Excess acidity or alkalinity can affect the availability of particular elements. Often the best treatment is to restore the health of the soil food web rather than adding mineral compounds. Seaweed solution provides a good source of trace elements. It is important to understand the important relationships between different elements that can influence, and in some cases antagonise, the uptake of other elements by plants (eg calcium and iron). While adding a little dolomite lime to the soil to correct acidity is relatively straightforward, generally correcting pH can be tricky with unpredictable results. To care for the soil organically you should avoid excessive tillage which has an adverse effect on soil structure and interferes with the soil food web. Deep digging may be unavoidable when establishing a garden but is unnecessary on an ongoing basis, and can be damaging to soil life. Never use a rotary hoe or dig or walk on the soil when it is wet. This will cause compaction of soil structure. Soil should never be left bare. A cover of mulch protects the soil from heavy rain that can erode and compact soil. It also encourages soil food web organisms and prevents weeds. Organic gardeners never use herbicides, pesticides or artificial fertilisers.